This entry was posted on Monday, March 2nd, 2009 at 2:14 pm	and is filed under commuter rail. You can follow any responses to this entry through the RSS 2.0 feed. You can leave a response, or trackback from your own site. According to the NJ Transit website as well as the NY Jets website, the service will have a formal announcement in June and will be available for the upcoming football season. As a Long Islander who will be a Giants season ticket holder in 2010, I am happy to see a link to Meadowlands. Apparently parking a flow from the new stadium will be much better than Giants Stadium, but a rail link for those days where tailgating looks iffy is a great option. 2 things though that I wonder about. Why can’t the LIRR have a direct train over there considering it already goes through Penn Station? Is it the overhead electric lines vs. on the ground electric connection? Secondly, is the train from Secaucus Junction a train, tram or light rail? If a train, why can’t the trains go to the stadium without needing to connect? As a LIRR rider, that would mean 2 connections/3 trains. How do you know parking flow from the new stadium will be better than from the existing stadium? The new parking flows haven’t even seen final design yet! In theory, an LIRR diesel-electric set (DE30 locomotive and C3 double-deck cars) could possibly run through to Secaucus from Long Island. But that’s only if there are no clearance issues and the equipment is permitted to run that route. You’d have to email the MTA to get the specifics. The train from Secaucus Junction to the Meadowland station will be a normal diesel-hauled NJTcommuter train, like the type that normally run on the Pascack Valley line, and other lines. You need to make the transfer at Secaucus Junction because there is currently no track connection in place between the tracks to/from New York Penn Station and the tracks to the Meadowlands. Such a track connection has been proposed as part of the “Mass Transit Tunnel” project that NJT is pushing full steam ahead right now. Yes, trains will run between Hoboken and the Meadowlands Rail Station for all NFL games at Giants Stadium. Why can’t they have rail service on the Pascack Valley line directly to the Meadowlands rail station instead of bypassing it to go to the Seacaucus Junction ? In theory they could. But at this point it seems they’ve decided not to. There could be a number of good reasons for this, ranging from a desire to dedicate the maximum amount of service to the shuttles to Secaucus, to the belief that a dedicated Pascack Valley line train to/from the Meadowlands might not be cost effective / not serve a significant number of people. Remember, for people along the Pascack Valley line, it might be a lot quicker, and a lot more convenient, and a lot easier, to simply drive to the stadium, since they live so close. I am attending the U2 concert on 9/24 at Giants Stadium. Will the train be running to the stadium that day and if so, what are the times? Yes, the train will be running to Giants Stadium on September 24, 2009. As is often stated, ” Train service begins 3 1/2 hours prior to the event start time and continues for 2 hours after the end of the event.” The most frequent service is 1.5 hours to 30 minutes before the event starts. One other thing about PVL (Pascack Valley) & Meadowlands; you are at the mercey of the PVL weekend schedule. For instance, 9/13 Giants game will end about 7p no chance to make the PVL from Secaucus at 722p therefore you have to wait for the next PVL train out of Secaucus at 923p. Yep. Some fans may choose to leave the game early to make the 7:22 PM PVL train. Wait, that train actually leaves Secaucus Junction at 7:32 PM. So if you leave your seat at 7:00 PM exactly, depending on how many people are already ahead of you in line at the Meadowlands train station (and depending on how far your seat is from the station and if the game has ended by then or not), you just may be able to make that 7:32 PM PVL at Secaucus. But whoa, I just looked at the schedule and that 7:32 PM PVL at Secaucus is one of the Metro-North Express trains that makes no stops in New Jersey! So that train is only good if you’re heading to one of the last three stations on the line. Everyone else HAS to wait until the 9:32 PM PVL at Secaucus. I doubt many people will wait, unless they plan on lingering at some post-game tailgating parties in the parking lot. Driving to, and parking at the stadium (or the off-site lots) would be a lot faster in terms of getting home. Hi. Does anyone know when, and how frequently, trains leave the Meadowlands? For a 1pm game, will any trains leave BEFORE the game ends? Like at halftime? Or, can one leave the stadium at, say, 3:30pm to make it back to Secaucus in time to guarantee that person will make, say, a 4:20pm train (will take 10-15 minutes to walk from seat to train, then probably a wait, then a 10 minute ride to Secaucus, then more waiting…I’m thinking that sounds right). Any ideas? Or do you need to wait until the game is over? Gregory, you ask a good question. It would be nice if NJ Transit provided a schedule for the whole day on one easy to read screen of their website, but instead you must use their special custom Meadowlands Trip Planner. Depart : MEADOWLANDS SPORTS COMPLEX STATION(On HOBOKEN) — 3:48 P.M. Arrive : FRANK R LAUTENBERG SECAUCUS LOWER LEVEL — 4:01 P.M. Depart : FRANK R LAUTENBERG SECAUCUS UPPER LEVEL — 4:20 P.M. Yes, you should leave yourself at least 10 minutes to walk to the station, more if you are sitting on the opposite side of the stadium. Get to the station a few minutes early. The NJSEA yellow-shirts probably won’t let you board until right before departure time. Be adamant and make sure they do let you board the train though! I have seen cases where the NJSEA yellow-shirts seemed to be confused about the outbound schedule and which trains people were allowed to ride (I assume all of them, but I could be wrong – some of the trains that arrive close to the start of the game might go lay-up somewhere instead of heading back to Secaucus and Hoboken). Thanks! Very helpful. I wonder why that says “(On HOBOKEN)”? It looks like they’ll leave hourly during the game, then I think I saw above that it will be more frequent after the game. Sounds like some decent options, and thanks again. You’re welcome. Yes, hourly during the game and then every 8 minutes or so on average after the game. It says “(On HOBOKEN)” because it is a Hoboken-bound train. I am going to the U2 concert from Stamford, CT. Will I be able to use the train service to the Meadowlands? I can’t seem to find a schedule. Edit: I wrote the below, then realized you are coming from Connecticut. The direct metro-north train service only runs for 1 PM Sunday football games. So what you should do is take metro-north to Grand Central Terminal and then use the subway or bus or taxi or walk to get to Penn Station. From there you take a New Jersey Transit train to Secaucus. And at Secaucus you transfer to a shuttle train to the Meadowlands. For more on the NJT part of the trip, read what I originally wrote below. Amy, yes you will be able to take the train. Take any normally scheduled train to the Secaucus station. Starting about 1.5 hours before the concert begins, shuttle trains will run frequently (every 8 to 20 minutes) from Secaucus to the Meadowlands. Earlier than that, the shuttle trains run less frequently. You can also use the NJT website to map out a specific itinerary. Go to njtransit.com and wait for the MEADOWLANDS banner image to appear in the center of the page. Click on it and then click on “schedule”. On the resulting page, choose your starting station and what time you want to arrive at the meadowlands. It will then tell you the train times and schedule that makes the most sense for you. Good luck, enjoy, and thanks for asking your question on my blog! Hi- We’re coming from central Jersey for U2 tonight and would like to take the train – I’m not worried about coming in since everyone doing a different time – but leaving. It’s great that the trains run for two hours, but how often? I’m worried we won’t get a train back if they’re running only every 1/2 hour instead, say, every 10-15-20 minutes…. I mean that there will be too few trains for everyone – and we won’t be able to get a seat on one before the two hour window is up – just want to clarify! Thanks!!! Amanda, I’m glad you’re taking the train! I just wrote you a long reply telling you not to worry, but then a friend told me about the mess that happened last night. Here’s an article: Train in Vain: U2 Fans Stranded for Hours After Concert. This is certainly bad news for NJ Transit. The article does not make it clear where the post-event problems really were, but it seems they were both at the Meadowlands Rail Station and at Secaucus, and caused by long lines of people at Secaucus buying tickets who didn’t buy their tickets in advance like they should have, and also not enough trains running along the Northeast Corridor to carry people away from Secaucus. The last train of the night to Central Jersey along the Northeast Corridor leaves at 1:50 AM from Secaucus. I think you should be able to make that. I also hope that after last night’s madness, NJ Transit will add additional trains along the Northeast Corridor if they are able to. However, I can’t guarantee that they will be able to solve of these problems in just one day. So you might want to consider driving. And I’m sorry I have to say that. Beware if taking the train to the Meadowlands for the U2 concert!!! If you are leaving from Manhattan your hellish experience will begin there with lines so long that you rather pay on the train. Dont do that!!!! wait on the line because you have to buy a ticket once you get to Secaucus and that is even worse because they only have machines. Also..make sure you get a roundtrip ticket. Forget about going home…took me 3 hours to get back to Penn last nite and the train ride is what…23 mins long. They obviously have no idea what they are doing over there. Maybe sure you wear comfortable shoes because you will be crying by the end of the nite. But I have to Say….SOOOO WORTH IT FOR U2!!! 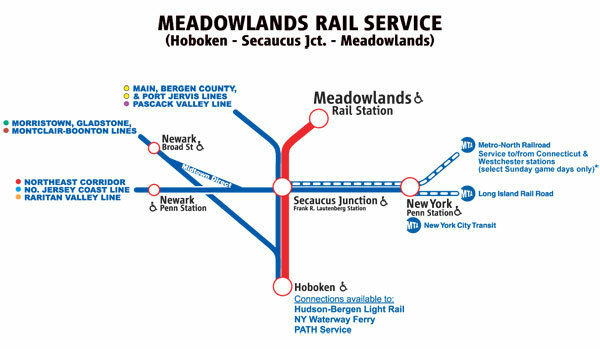 Do the Hoboken to Meadowlands trains stop at Secaucus? Kathy, yes, they do stop at Secaucus. I too was a victim of the train on Wednesday night. What are you going to do for Bruce next week with people all coming and going at the same time? He does not have an opening act. I was so late on Wednesday that I did not get to see any of Muse and I just heard from my brother who drove last night that he was back home on Long Island by midnight and the poor guy who sits next to me did not get back into Manhattan until 2:00. I see also Brian, that you did not respond to Alison above but you did respond to everyone else. What can I say? It looks like something went very wrong on Wednesday, and it’s not right that so many people were inconvenienced. I hope that NJT fixes everything for the concerts next week. I haven’t heard how Thursday night went – maybe they already fixed the problems. Unfortunately, they have not, like I said above, my brother drove to long island in under an hour and my friend at work took 3 hours on the train last night. I will be driving to Bruce on Wednesday and I think that will be my last visit to the meadowlands. I will be sticking to my side of the river from now on. I’m going to Bruce Wed from midtown Manhattan. What train(s) will get me there? Chet, you can take any NJT train leaving Penn Station that stops in Secaucus. These trains are designated by the “SEC” on the train departure displays around Penn Station. But before you leave Penn Station, make sure you purchase a round-trip ticket to the Meadowlands. Can you purchase a round trip train ticket from the PATH Station at the World Trade Center to the Meadowlands or do you have to purchase your PATH Ticket at the WTC and then your rountrip to the Meadowlands at Hoboken? I believe it is the latter. You need to purchase your PATH Ticket at the WTC and then your round trip to the Meadowlands at Hoboken. I don’t think there are any NJT ticket machines at WTC. The train picked us up in Greenwich at 10:04, which meant leaving my house at 9:30, a full 90 minutes earlier than I would have left if I was driving. This was because the arrival times at the Meadowlands make no sense for a 1:00 PM game. Our train arrived at about 11:40 – way too early for a 1:00 PM game – and the next one arrived at 12:48, which is way too late to make it to your seats by kick-off. So what it meant was that if we wanted to see the beginning of the game, we had to arrive at our seats a full hour before kick-off, which was tolerable on a nice day like yesterday (high of 48 degrees and sunny), but what would we do in a rain storm or on a cold day? So I left my house an hour and a half earlier than I would have liked and arrived at the stadium an hour early – not good. Total time of the trip from door to stadium gate was about 2.5 hours – at least 30 minutes longer – probably more – than if I were to travel by car. As for the trip itself, the train to Penn Station was fine. Quite pleasant actually. Upon arrival in NY though, you spend 15 minutes at Penn Station just waiting, and the train turns into NJ Transit train, so it really fills up. Not a big deal, but the wait is annoying. The transfer in Secaucus is harmless – pretty easy to figure out where to go and what to do. The trip to the Meadowlands is advertised as a shuttle, which it really isn’t. The ride is about 15 minutes on a slow and crowded train, but again, no harm. The station at the Meadowlands is a 2 minute walk from Gate B, which works well. Overall grade for the ride out is a “C+”. Not great, but not horrible. Improve the timing so the train arrives at 12:30 and dump the 15 minute wait at Penn Station and it would improve. But it was ok…. The ride back was far worse. After the game we walked back to the Meadowlands station and were greeted by a fairly large group of people just waiting around. There were no signs about when the next train was and which track to go to, and the police were keeping everyone behind a series of ropes. We waited like cattle for 10 minutes – not a big deal, but again, what are you going to do on a cold or wet day? I had an 8 year old with me and this would have been very bad on a day with inclement weather. So we’re finally let up on the platform where an 8 or 9 car train was waiting. However, they only opened the doors on the first car, which meant that everyone had to walk up to the front car and begin making their way back. Inconvenient, and it began to get potentially dangerous when the door between carriages jammed and people began piling up behind the jammed door and the surge of passengers boarding the train. Once they finally got passengers on board, the train just sat there. No announcement, no nothing. Just a full train sitting on the platform for 25 minutes. We finally lurched our way to Secaucus, where the signage and help was awful. Nobody seemed capable of pointing us in the direction of the football train. We were not alone, as others experienced the same issue. We were told several times by staff to take one train, which clearly was not going to Connecticut. We finally got onboard a regular NJ Transit train to Penn Station and figured we’d either find the football train there or head over to Grand Central and take the Metro North. After arriving at Penn Station we found the football train on the departure board, but because this is Penn Station they don’t tell you what track to go to until 5 minutes before departure, so we ended up just standing there in a crowded and dirty station with hundreds of other equally confused and increasingly frustrated people. We finally get on board, and to be fair, the trip home from Penn Station was very relaxing. Door-to-door was about 2.5 hours, which, even with bad traffic, is a little longer than it usually takes after a game. Trip home was a “D”. We were all frustrated by this experience because, quite frankly, we wanted to like the new train service. I could only imagine what would happen if this service got very popular and had to handle double or triple the number of riders it currently supports. Sadly, the next time I go to the Meadowlands I’ll just get in my car. The train just wasn’t worth the hassle.